All in all, I absolutely love this new feature! :) Thank you Duolingo! Fabulous! And for nouns you see the gender. Wonderful new feature. Thank you, Duolingo. When can we use this? I'm able to use the word feature for German and Spanish. But not for Irish, which is still in beta. The only thing missing is having the ability to Strengthen, that one word, BUT this is Good thing.... You have to return to the unit it was in and practise there. Meaning that at the same time you possibly get to strengthen lots of similar words! The Old Vocab could be a bit of 'Cheat' with a few sentences to do, - An easy way to keep your streak going!! It's really great that they're paying attention to the community's feedback and restoring the old features that many of us have missed since their removal in January. Now newer users or those that never looked at the vocabulary tab before can see why those of us that used it were so upset by its disappearance. This is even a significant improvement over the old version's presentation method. Also, I agree with you about the individual word practice - it was always a bit goofy in that it's not much of a practice if you know the word you're about to be presented. Really the only thing it was good for was to update a word that, due to bugs with the word strength / decay system, may not have otherwise come up in the course of normal practices. Kudos to the Duo devs! Thanks for that I am learning Portuguese, when the box appears with the word in when I click on more details it is greyed out. How do I view this info? Do you have the words tab? I just noticed that, so thanks! :) Awesome feature, thanks for posting about it. Thanks! I was curious to see that words tab everyone was talking about, it looks amazingly useful. 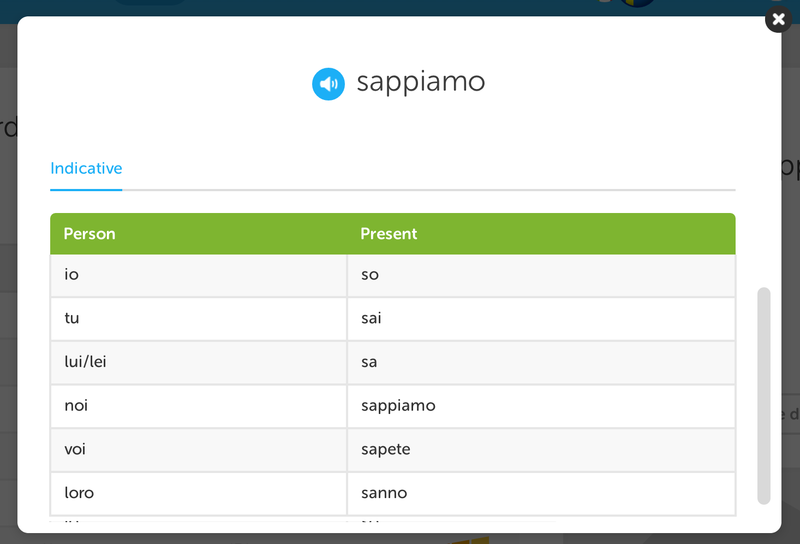 For verbs do they have conjugation tables for other tenses at the top next to indicative in your case for sappiamo? ex: in French parler: Present tense: Je parles tu parles il/elle/on parle, etc. And then next to that you click on imparfait. Imparfait: Je parlais, tu parlais, il/elle/on parlait, nous parlions... Single word future tense: Je parlerai, tu parleras, il/elle/on parlera Conditional: Je parlerais, tu parlerais, il/elle/on parlerait So basically what I'm asking is there a button to click so you can see every tense for a certain verb? As far as I noticed (comparing two of my trees), you only see the tenses you learned until that moment. So if you just did the Present skill, you only see that, but when you finish the tree you see all the tenses. Yes, you have buttons to switch between the tenses of the indicative/subjunctive/other tenses (infinitive, participle). It only shows you up to what you have done. 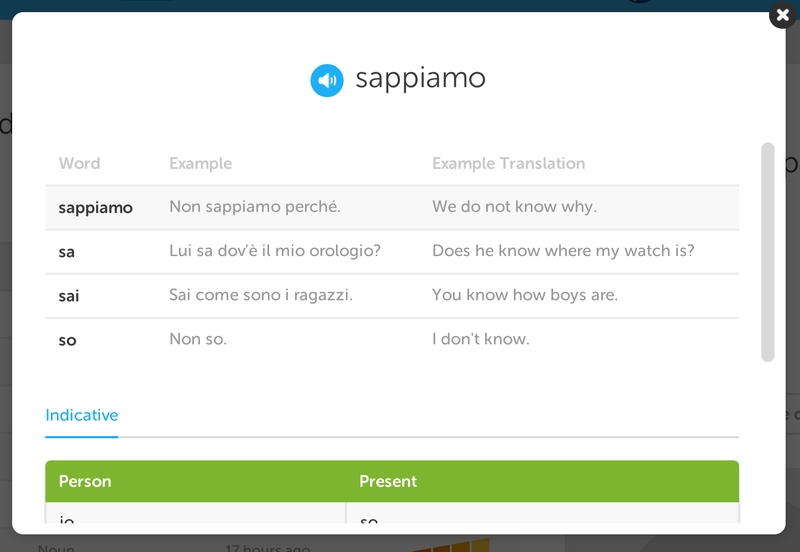 The slight problem is, I clicked on sappiamo (meaning 'We know'), and the conjugation table has all the conjugations, but it doesn't show the infinitive (which is 'to know'-sapere). The new feature is very nice. Quite excellent. But I REALLY like/miss/want to be able to sort the word list by Skill as well. I've been maintaining a notebook of words I've learned, organized by Skill, to help me track my progress and study/review in the order I learned, and the lessons were taught. Not all the skills pages list all the words for each lesson. They have most, but if it's more than 4 lines of words, they just put a comma to indicate more words for a lesson. The text is there, it's just hidden behind the button to begin that particular lesson. You can highlight all of the words and copy & and paste it into a document or text file and do whatever you want with it. That's interesting! I've got the first screen, but when I ask for more details the screen just goes dark and nothing happens. (Just discovered this works fine on a Mac, but not on my iPad) I've still got the flashcards, which others have lost, so maybe the are subgroups in the original test group? Aaahhh, I'm so excited! This is amazing. Why, what with the Incubator bustling, the "review lesson" feature, the beautiful, if not so new, design, and now this FABULOUS and SPECTACULAR feature -- well in my opinion, Duo is greater than ever now!! Thanks for the thorough post and photos Kgm7, so here are a few lingots for you :) ~~ still, I wish the team would make an official post so we could officially shower them with lingots!! what do you mean, I don't understand what how you can do that. Can you explain that again to me? Some of us do not have the Words tab. I think that it is great that Duo is running a trial with some people have different features, but it is a little irritating when people come on telling us how great it is. Do you think that it would be a good idea if they let us know about the trials that are running? I would be interested to know what percentage are given the test features and for how long. Perhaps they could give this sort of information on the official Duolingo blog - or as a "sticky" on top of the discussions board. Good idea! Also, I've only found out about some things like flashcards through these discussions - I simply had not noticed the change, so the team might have thought I was not interested when I just did not know it was there! I don't have the Word Tab, so that's why I didn't understand what you mean. Looks great! Can't wait until it's rolled out to everyone. It would help me a lot - especially with those irregular verbs. how do we update it?? I absolutely love this new, new feature! It is so much better than the previous falshcards!!!!! Oh, what fun! Thanks for pointing this out, Kgm7! I thought I had lost it yesterday! I was wrong! Flashcards are still being tested, Duo just shuffled some of the test group memberships, so some that had flashcards two days ago, lost them yesterday. It looks like some lucky few get to have both still. I have neither. Definitely excited for this feature. I haven't had the ability to test it yet, but I had the flashcards and (while I love all of the work Duolingo puts into all of their updates) I was pretty disappointed with those. This, however, looks fantastic! How extensive are the verb conjugations that they list? Do they list all of the forms, or just the present tense? I think it depends on what tense you've reached on the tree. I've only just passed the Present Tense 1 skill so only the present tense shows :). I got it on mine! It does show all of the verb forms. Mine was separated into tables in three categories: Indicative (Present, Future, and Past Imperfect), Subjunctive (Present Conditional and Present Subjunctive), and Other (Gerund, Imperative, and Infinitive). Examples on usage of all the forms (as far as I could tell) were at the top. Is there a practice button? It would be helpful for conjugation practice. When i can use this? Could you please inform me how I can reach this feature? I cannot find it. I have a list of about 1600 words, most of them with 4 bars ("Still Strong"), but down at the bottom there are quite a few with 1 bar, which I can't get rid of. I have repeated the relevant lessons, and practiced them repeatedly, but they won't go. At the end of the list I have about 10 words with "Last Practiced" 5 months ago, which is simply not true. I have seen these words more recently. Does anybody know how to fix this? I have found some more stuff out. 1. Repeating the lesson doesn't count, even if you 'see' the same words again. You have to see the words during practice of the lesson. 2. I think you have to see the words during practice of the same lesson. 3. Some words don't come up in practice. In particular, I have about 9 words from the lesson "Present 1" in Italian, which are at the bottom of my list, which I can't refresh. It is as if the words are in the lesson, and get added to the list, but are not in the practice. And I found something else out. Use Chrome in preference to Firefox. It works better. I'm from Poland and I learn English. I haven't the list of words. When it will be? well, that version bit the dust. It's hopeless the way it is now. When you click on the word, it give sentences that the word is used in but no way to know what lesson it was first introduced so you can practice it. And the sort feature only works for each time frame, so I can't sort all the words by noun and have them all together. I really don't do well with change because changes don't seem to always be for the better. New French Tree! New words/lessons to learn! New Update on the Words section- I love it!